The month of April has brought about a bevy of changes to the Modern format. Between the banishing of the Eldrazi back to from whence they came, to two notable unbannings, to the announcement that the Modern Pro Tour is no more, there has been plenty to discuss and ruminate over. While some big questions are definitely at the heart of some of these changes—What is Wizards’ philosophy regarding bans? What is the fundamental purpose of the Modern format—some are more mundanely tied to the metagame itself. Namely, since Ancestral Vision and Sword of the Meek were released from the banlist, Moderners everywhere have been theorizing and brewing nonstop to solve the puzzle they present. As a community we’re all but certain there is a place somewhere for these historical powerhouses, but the million-dollar question is where. This question essentially comprises two components. The first is what archetypes these cards may fit into, whether existing established ones, or completely new archetype(s) made viable by the new cards. The second is how the adoption of these cards changes the surrounding shell—what cards are no longer necessary, what cards have increased in stock, if new strategic axes can be incorporated into the deck’s game plan, etc. Today I’m going to look at the data coming out of Star City Games’ States and Provincials last weekend to see if we can get a bead on Ancestral Vision‘s place in the metagame. I’ll be breaking down all of its appearances in the Top 8 of any of these events, and discussing which shells and archetypes seem best suited for it at this juncture. For now I’ll table discussion of Sword and just focus on Vision (admittedly, this may relate somewhat to my bias towards drawing cards), but as you’ll see, many lists have adopted both. First, a note on methods and sample size. Right now 53 US states and Canadian provinces are showing results on SCG’s website. Among these Top 8s, a total of 39 decks running Ancestral Vision in some capacity made an appearance, about 9% of the total Top 8 competitors. This is a pretty small sample size. Several states are obviously missing (including my home state of Minnesota, which I know for a fact ran States) and there are a few duplicate entries as well. I’ve tried to eliminate these flaws from the data to the best of my ability, but we won’t be delving into confidence intervals, statistical significance or any other in-depth quantitative analyses. I’ll leave that to Sheridan for his metagame updates and top deck pieces, and focus today on more qualitative questions about the possible directions Vision can be taken in Modern. So with those caveats, below are all the decks running at least one copy of Ancestral Vision that made Top 8 in an SCG States or Provincial tournament on April 24th, 2016. The overall picture gets a little clearer if we group together similar decks. Blue-based control shells of some variety, including Jeskai, Grixis, Sultai, UW, and Blue Moon, together account for 59% of all the decks running Vision. This probably comes as a surprise to nobody, although the sheer variety of different builds is impressive. The next two major players were Scapeshift and UB Faeries, occupying 15% and 10% of the total Vision decks respectively. After these three major archetypes (all of which have benefited from extensive speculation and discussion following the Ancestral unban) there’s a smattering of one-off decklists like Esper Tokens, Through the Breach, and Mono-Blue Turns (!). Today I’ll be focusing mainly on the three best-represented archetypes, Ux Control, Scapeshift, and UB Faeries. Let’s see how Ancestral Vision was incorporated in these decks, and look at the possible avenues it opens up. When it comes to drawing three cards for the low cost of U and four turns, no one gets more excited than the control mage. The obvious place to start was with Grixis Control, which has cemented itself as a Tier 1-2 deck for the better part of a year now, and seemed ready-made for the release of Ancestral Vision. A little under half of the control builds went this route, while an equal number elected to resurrect the old Jeskai Control deck using the power of the new card draw spell. Rounding it out we have a few copies of Sultai, Blue Moon, and UW. With just a few exceptions, all of these decks ran the full playset of Ancestral Vision in the maindeck. Ancestral Vision is basically a perfect fit here. While it doesn’t combo with Jace, Vryn’s Prodigy or Snapcaster Mage technically, it does complement the same strategy and supporting cast of cards. It’s particularly insane alongside Jace and Goblin Dark-Dwellers, which together let you loot away and cast any drawn Visions immediately. This deck is great at playing the tap-out control role; it will slowly and inexorably amass card advantage every turn with a constant stream of two-for-ones, then refuel when Ancestral comes off suspend or Goblin Dark-Dwellers successfully flashes it back. Resolved Ancestrals can’t really hit any bricks—just more kill spells, more card draw, more interaction. About a third of the Grixis players (again, warning about sample size here—we’re talking just three decks) included 2-3 copies of Thing in the Ice. Thing seems like an excellent way to leverage the large number of cheap spells that Grixis naturally casts during a game, and helps gain back whatever tempo is lost waiting for Ancestral to unsuspend. Thing in the Ice also provides the deck with a Splinter Twin-like kill switch, which while not immediately lethal, does allow the Grixis player to pivot quickly and end the game before an opponent in the explosive Modern format can topdeck that final burn spell or combo piece. This technology was adopted by one of the Blue Moon players as well. While Grixis players seemed to play around with Thing in the Ice, Jeskai players were more keen to experiment with Thopter-Sword combo. The lion’s share of Jeskai decks were basically just the old lists from years past with four Ancestral Visions thrown in for good measure. For most of them the game plan seemed about the same as always, to stall long enough to find 9-12 points of burn and finish off with motley Snapcaster and Colonnade beats. Certainly it may be the case that Ancestral Vision is the push these decks needed to bring them back into the Tier 1 or 2 limelight, but the Thopter-Sword package adds an intriguing element. In addition to providing some incremental life gain to pull out of burn range after stabilizing, Sword gives these Jeskai decks an actual honest-to-god resilient wincon outside of planeswalkers. On the scale from controlling to aggressive, the Jeskai builds are much closer to “real” control decks than the Grixis decks. With a larger average number of counterspells, fewer creatures, and Cryptic Commands, Jeskai plays a mean draw-go game in contrast to Grixis’ tap-out style. This might be why more chose to adopt the Thopter-Sword combo over Thing in the Ice, as a true control deck is more interested in the life gain and inevitability than a 7/8 beatstick. Grixis, on the other hand, can play a pseudo-Jund style game with some beefy creatures that hit hard like Pia and Kiran Nalaar and Tasigur, the Golden Fang. In that world, the Awoken Horror is a little more on plan. Either way, there’s no reason why these developments can’t be adopted by either builds, and indeed two players did buck the trend with a Jeskai Thing deck and a Grixis Thopter deck. Right now it looks like control can be built in a myriad of ways, but it seems safe to say 4x Ancestral Vision is a good start. Whereas the control shells were basically built around Ancestral Vision, Scapeshift decks in the Top 8 used them as more of a roleplayer. 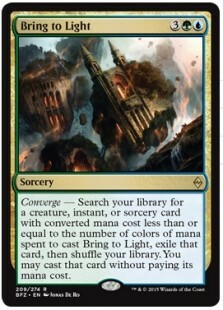 There were two basic approaches: the first was as a singleton copy to fetch off of Bring to Light, the second as a sideboard plan to transform into a more controlling role. These two approaches were divided evenly among the six Top 8 competitors. I’m a little skeptical of the Bring to Light into Ancestral tech, mostly because I feel like in Modern we can do better than Brilliant Plan. That being said, three players made it work for them. It is nice to have a card draw spell that’s near-busted in the opening hand, but which can still be reliably cast when “drawn” later in the form of Bring to Light. One of these three decks ran two copies of Vision, which I could see becoming more commonplace. That increases your chance of seeing it in the opener, and extra or late-drawn copies can be pitched to Izzet Charm. This list was a typical implementation of the Ancestral sideboard plan. Scapeshift has always been a secret control deck capable of grinding with the best of them, especially the Prismatic Omen builds. Ancestral out of the board gives the deck more inevitability against decks who can’t Nacatl, Memnite, or combo-kill them to death in the early turns. Do you counter the Ancestral and leave yourself vulnerable to a Scapeshift? Do you let it resolve and hope they can’t find enough land drops to trigger Valakut naturally? Good luck. I really like the sideboarded Tarmogoyfs here too. They can come in to pressure fast combo or stonewall Zoo, and along with Visions allow Fevretto to turn into a kind of Temur Tempo deck post-board. Overall this deck looks really flexible in its plan of attack, and the sideboard allows for some good-old fashioned misdirection to mess up opposing board plans. Finally, we have the old bogeyman of Standard (and Extended) past. UB Faeries has skirted on the edge of Tier 3 in Modern since the unbanning of Bitterblossom, and the hive mind was collectively excited to see if Ancestral Vision could push it into full-on Tier 1 competition. The variety in Faeries builds from last weekend was pretty large, even with just four decks, which probably reflects the relative lack of development in the archetype. What they all shared in common was the inclusion of 3-4 Ancestral Vision (although one player put them in the sideboard). Note that no Faeries builds that eschewed Ancestral entirely appeared in the States Top 8s at all. This was the cleanest-looking list, with nothing fancy in the creature or spell base. Daniel cut Snapcaster Mages entirely, which were a two- or three-of in the other three lists. Ancestral Vision pretty obviously does here what it has in Faeries builds since the beginning—reload on Thoughtseizes, counterspells, and Mistbind Cliques to put them in the ol’ Faeries squeeze. Welcome to Modern, Ancestral-into-Bitterblossom fix! We’ve missed you. While Ancestral is certainly a great addition here, it doesn’t seem to shore up Faeries’ traditional problems. You’re still heavily reliant on Bitterblossom. You’re still an aggro deck with mediocre bodies that struggles against the meatier white and green creature bases. You’re still a synergy-based deck in a format defined by raw power and brokenness. You’re still struggling in the early game without Lightning Bolt to beat back aggressive starts. It’s interesting to note that Faeries doesn’t really get any new tricks to do with its Ancestrals. Where Grixis gets to Dark-Dwellers it back, and Scapeshift can use it for toolbox tutoring or post-board positioning, all Faeries can do is just stick it in the 75. That’s another way of saying that Faeries is probably not the best Ancestral Vision deck, but it does seem to be nipping at the other ones’ heels. While Faeries may have the reputation of most-busted Ancestral Vision deck, the numbers here don’t bear that out. It appears pretty solidly outclassed by control variants, and slightly outranked by Scapeshift. It stands to reason that if all the blue decks get the same new tools to play with, the best archetypes leading up to the change will be advantaged (meaning Grixis and Scapeshift). That being said, the return of Jeskai Control in what appears to be full force belies that idea. It may be that the dual additions of Ancestral and Sword were enough to push this deck back to the metagame-defining monster it once was—only time will tell. There are some other really cool Ancestral builds from States/Provincials that I’d love to try out, like the Esper Tokens deck that makes heavy use of Monastery Mentor, or the Abzan Blue deck that uses Ancestral to fuel up on Siege Rhinos and other haymakers. There’s still a ton to explore with this card, and it will be interesting to see what the community comes up with. At 9% of the total Top 8 decklists, it’s clear that Ancestral has made its impact felt, but it’s not so ubiquitous as to bowl over everything in its wake. We might see more copies as people figure out better shells and tune existing lists (or locate copies of the now hyper-expensive card). But don’t underestimate Modern’s eternal diversity, nor its ability to punish opponents trying to durdle around. Ancestral is here to stay, but it’s not the only kid on the block. How do these lists line up with your testing and theorizing around Ancestral Vision? How do you see these archetypes evolving as people get in more reps and iterate them? Any groundbreaking new Vision shells that you think will break everything open? Let us know in the comments, and thanks for reading. I love this article. Firstly, I’ve been intrigued by what decks would actually reach for Ancestral Vision, and I’m glad to see that my initial instincts were mostly correct (I whiffed on Scapeshift, but given that it’s just sideboard tech as opposed to being front and center, I’ll count that as a half-win). I think I like Ancestral Vision in the Grixis list the most – Goblin Dark-Dwellers is a genius piece of tech, and the only cards I’m not really feeling in the mainboard are Thought Scour (a necessary concession for Tasigur), and Tasigur himself (big body, but I don’t feel like his grindy recursion is as necessary with so many ways to mine the graveyard for value already present). I’m surprised the Jeskai list went with Thopter + Sword as its steady wincon over something like Elspeth, Sun’s Champion (which is what the UW Control lists in Eldrazi Winter employed to very good effect). That Scapeshift mainboard is excellent – I’ve tested it out myself after the tournament results were posted (with some minor manabase tweaks), and it did very well, which is notable because I’m not an experienced Scapeshift pilot. I’m not sold on the sideboard at all, though, especially considering that my take on the sideboard was very different and it still performed well. My most scathing criticism, however, is reserved for the Faerie deck – I think that the shell that is being presented is not very good, and probably succeeded due to either the skills of the pilot or some favorable variance. It’s overly dependent on Bitterblossom, and is in an awkward spot in the aggressive-to-controlling scale. It’s weak to decks such as Affinity, Gruul Zoo, and Burn because of its utter lack of proactiveness, and other controlling decks will go over the top of its forces fairly easily. I am of the opinion that Cryptic Command and Mistbind Clique are a bit of a trap for Faeries players, as they push you too far down the control path. Additionally, I can’t condone the omission of Scion of Oona, which both protects your Bitterblossom and makes it exponentially more dangerous. I think that a tempo deck with some “go-long” elements such as Ancestral Vision is the optimal way to construct a Faeries shell, and my preliminary testing against decks such as Jund (a boogeyman for Faeries for as long as I’ve been playing Modern) has definitely given me confidence in my assertion. It’s a distinct possibility the selected Faeries list is terrible. One of the four Top 8 lists did run Scion of Oona, but there was a ton of variation in approach, including Tasigurs, more spot removal, maindeck Sword of Feast and Famine, and lots of other random stuff. The standard Faeries package has clearly proven lackluster in Modern, so it makes sense we’d have to make some radical changes to arrive at a Tier 1 or 2 contender. Regarding Jeskai, a majority of the decks (two thirds) omitted Thopter-Sword. I believe only one was running big Elspeth, with more popular wincons being Elspeth, Knight-Errant, Ajani Vengeant and Gideon Jura. I have to ask where we draw the line between control and midrange. The grixis deck looks like “blue jund” to me – it has a bunch of sorcery speed spells and four drop value creatures like pia and Kiran and kalitas. The whole deck has two counterspells. The jeskai deck ill more buy as control – it’s got a much lower body count and is mostly instant speed interaction. “Control” does not mean “uses lots of instants/counterspells and not many creatures”. Some of this is just naming convention, but the Grixis list I posted (and most of the SCG States Top 8 lists were similar) probably does play closer to “Blue Jund.” Of course even Jeskai has always been a glorified burn deck masquerading as control—we’ve yet to see a “true” control deck in Modern in the vein of Esper Dragons or Miracles, with the possible exception of blue-based Tron. Ha good to hear. I know its kind of semantics but I’ve been telling folks that AV is a midrange card and not particularly good for a control deck – was distressing to see the analysis show that actually most of its success is in “control”. On the front page metagame table its labeled grixis midrange and then jeskai control – I think that’s fair. As Jacob says, control would be defined by few creatures, mostly instants, and I would add in most cases “winning at its leisure” once a soft lock is established rather than trying to be fast. This issue is so contentious and, I believe, distracting that I’m going to be merging the Grixis Control/Midrange shares for this coming update. If it doesn’t work or proves to be misleading, I’ll switch it bad for subsequent ones. Jeskai Control vs. Jeskai Midrange is a little more established based on the presence of countermagic, creatures like Geist/Splicer, etc. But the Grixis one started hazy during Chapin’s run at GP Charlotte and got significantly less clear as Grixis started adding more IoK and less Cryptics. Rather than get too distracted by this, I’m just going to try a new classification for the update next week. Grixis decks comprise more of a shell that you can fill with the cards that do well in different metas, there are some notable differences between “Blue Jund” and “Grixis Control” eg virtually none of the running jace and none of the former running 4 delve creatures, but there are enough in-betweeners with some of the “control decks” running Jace and a fair share of counter and some “midrange” decks not running jace, but also not running many counters as well. The difference is probably just a more accentuated version of how Abzan decks can differ wildly from “Big Abzan” as the deck that top8d GP Singapore last summer to a mean and lean package like the one WIlly Edel brough to GP Charlotte with no 4drops and bobs. The nomenclature gets murky when both Jeskai decks with Geist which is really midrange decks, with the Kiki-combo and those with more ‘proper’ control wincons get lumped together as Jeskai control and you see a similar thing happen with Grixis decks. Thanks for the true return to form guys, I was really scared that the QS takeover ruined everything – I see now that my fears were in error. Ive been playing 4 av in my rug scapeshift deck main and its been great for me. Can someone please explain to me why most players have moved it to the board? Games almost never end before it comes off suspend, and if they do, i was losing that game anyways. I have gone up an izzet charm to loot away dead copies, and i can board them out when theyre bad. I dont see why i wouldnt main four.